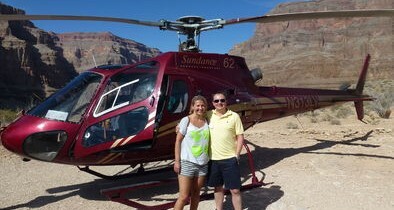 After you take off from Las Vegas’ McCarran Airport for your Grand Canyon helicopter tour to Grand Canyon West, you will enjoy breathtaking views of all the major landmarks between Las Vegas and the Grand Canyon including Lake Mead and Hoover Dam. Once you have descended 3,200 feet down inside the canyon, you can explore the floor, take photographs and soak in the splendor of the canyon’s beautiful colors. Enjoy a picnic meal along with champagne hosted by your pilot. Your Grand Canyon helicopter tour concludes as you lift off and head back to Las Vegas where you will fly over the fabulous Las Vegas Strip! Well they weren't kidding about it being likely to sell out. We had to settle on a different day to get it in, but it was worth the wait. Amazing landscape, amazing views, amazing amazing!